I always been fan of good looking desktops. It looks amazing to me when the desktop of a lap top or PC is perfectly and cleanly organized, with great wallpaper and gadgets. 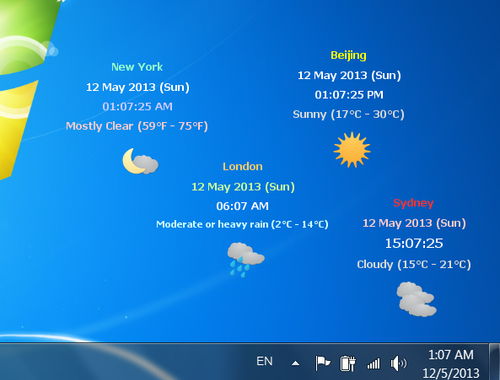 Recently, we found one great free desktop world time clock that looks and works perfectly fine. Basically this is what our site needed, a clock that can show what is time on several cities in different parts of the world. Why we needed this? Because we collaborate with many people around the globe, and we want to know at what time we call or contact them. So if you are in similar situation, or simply you want to know what is the weather in different cities, this is the gadget you want to install on your desktop. What is great about this software is that it includes over 600 cities in over 220 countries and there are some great customize features. You can choose which cities will be displayed on your desktop, in which font and font size, the format of the date and date shown and also whether the world time to be shown in 12 or 24 hours format. On top of that, this desktop gadget offers local weather. So if you choose the feature, not only that you'll see the time, you'll also see the weather in some pretty appealing icons. Also there is the time converter, which will enable you to see and compare the time with another specified city.